Article abstract The authors used serial gradient-echo MRIs to detect new small hemorrhages in patients with previous lobar hemorrhage. Of 24 lobar hemorrhage patients (17 diagnosed with probable and 7 with possible amyloid angiopathy) who prospectively underwent repeat MRI 1.5 years after initial study, 9 (38%) demonstrated additional hemorrhages at follow-up. Interrater agreement was high. New hemorrhages were more frequent in patients with probable amyloid angiopathy (8 of 17, 47%) with more hemorrhages at baseline (p < 0.01). These results suggest a role for gradient-echo MRI in assessing disease progression in amyloid angiopathy. A goal of cerebral amyloid angiopathy (CAA) research is to develop markers of disease progression. Recurrent lobar cerebral hemorrhage, the most clinically salient marker of CAA, does not easily lend itself to small-scale research studies because of its low and variable frequency. Other correlates of CAA are either undetectable to noninvasive methods (e.g., microvasculopathy, microinfarcts, and senile plaques1) or have an uncertain association with disease severity (e.g., ischemic white matter damage2). The current study focuses on gradient-echo MRI to detect the small, clinically silent hemorrhages that can accompany symptomatic hemorrhage in CAA. Studies using this technique have detected scattered small lesions in a substantial proportion of patients with primary lobar hemorrhage3,4 and, less commonly, in elderly control patients.5 A report correlating gradient-echo MRI images with postmortem examination identified some of the radiographic lesions as perivascular hemosiderin deposits, termed “microbleeds.”6 Although the pathogenic mechanism underlying these small focal hemosiderin deposits has not been established, it seems likely to resemble the process that leads to larger lobar hemorrhages. We sought to collect pilot data on the rate at which new small hemorrhages emerge in patients with lobar hemorrhage and the reliability of gradient-echo MRI for this purpose. The results support the use of gradient-echo MRI as a candidate marker of CAA progression. Patients were prospectively recruited for serial MRI scans from a cohort of consecutive individuals presenting to the Massachusetts General Hospital or Spaulding Rehabilitation Hospital with symptomatic lobar hemorrhage. As part of the larger cohort study, survivors of the index hemorrhage (and their family members) were systematically interviewed at 6-month intervals for new symptoms suggestive of stroke or cognitive deterioration. Patients were recruited from this cohort for the current MRI study if 1) their baseline MRIs demonstrated hemorrhage or hemorrhages confined to cortical or corticosubcortical brain regions without other known cause,7 2) they had no new fixed focal symptoms during the 1- to 2-year interval after their initial study to suggest recurrent hemorrhagic stroke, and 3) they were willing and able to undergo a follow-up MRI. Patients described here presented between October 1993 and January 1998 and had follow-up studies between January 1996 and March 1999. Average patient age was 72.2 ± 7.8 at the time of baseline MRI, and average interval between baseline and follow-up was 17.4 ± 7.6 months. One of the patients (table, Case 16) experienced recurrent transient spells of left-hand weakness and dysarthria,8 as well as subtle cognitive changes during the follow-up interval; another (Case 15) had transient spells of right arm tingling; a third (Case 23) had gradual progression of preexisting dementia. All were able to live independently throughout the study interval. The study was conducted with informed consent from all participants and approval of the Subcommittee on Human Studies. MRI scans at baseline and follow-up were performed as described3 on a 1.5-T superconductive magnet and included multiplanar axial gradient-echo sequences (repetition time [TR] 750, echo time [TE] 50) of 6-mm slice thickness and 1-mm gap. All 24 pairs of images were analyzed by one rater (E.K. ), and 17 baseline and 15 follow-up studies (those before March 1998) were analyzed independently by a second rater (P.W.S.) without knowledge of clinical information. Raters had access to T1- and T2-weighted spin-echo sequences for comparison. It was agreed before the study that only lesions considered to be independent hemorrhagic foci would be counted, thus excluding hypointense signal suggestive of vascular flow void, superficial hemosiderosis, or nonhemorrhagic iron deposition in subcortical structures. Interrater reliability for hemorrhage counts was assessed by the intraclass correlation coefficient (ICC), representing the proportion of total variance caused by true variation between subjects (ICC = 0 indicates no interrater reliability, and ICC = 1 perfect reliability). Hemorrhage counts were logarithmically transformed to convert to a normal distribution (determined by Shapiro-Francia test). Analysis of the number of new hemorrhages appearing at follow-up was performed by Poisson maximum-likelihood regression, controlling for the time interval between the two studies as the period of exposure. All analyses were performed with Stata software (Stata Corporation, College Park, TX), and all significance tests were two-tailed. Of the 24 patients studied (see table), 17 carried a diagnosis at baseline of “probable CAA” based on the presence of two or more strictly lobar hemorrhages (Cases 8 through 24), whereas 7 with single hemorrhages only (Cases 1 through 7) were diagnosed with “possible CAA.”7 Nine of the 24 (38%) demonstrated a total of 42 additional hemorrhages (range 1 to 11) at follow-up relative to baseline (figures 1 and 2⇓). All new hemorrhages were small and located in lobar regions. Comparison of baseline and follow-up studies revealed that old hemorrhages generally remained stable over time (see figure 1): only 4 of 176 (2.3%) total hemorrhages at baseline were undetectable at follow-up. Figure 1. Appearance of new hemorrhage on repeated gradient-echo MRI in Case 16. 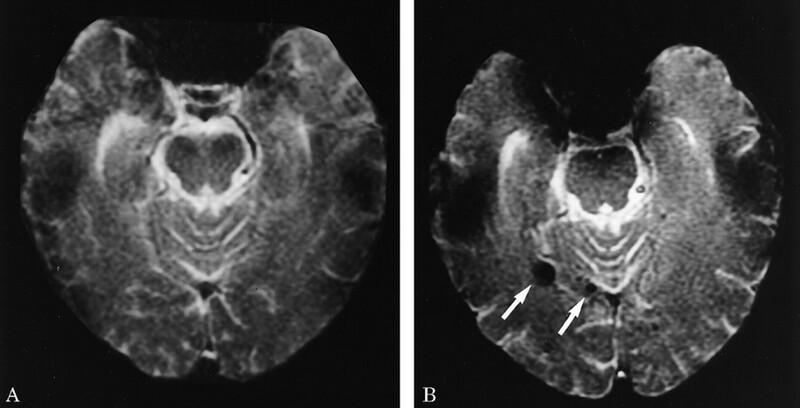 The follow-up study (B) demonstrated two small right-sided occipitotemporal hemorrhages (arrowheads) that were present at baseline (A) and the interval appearance of a new small hemorrhage in the left occipital lobe (arrow). Figure 2. Case 15. (A) Baseline MRI. The follow-up gradient-echo MRI (B) demonstrated multiple new small hemorrhages including new right occipital and occipitotemporal lesions (arrows). We took several steps to assess the reliability of this technique. Analysis of 17 baseline and 15 follow-up studies by an independent rater (see table) revealed high interrater agreement for both baseline and follow-up hemorrhage counts (ICC = 0.97 for each measurement). Among patients with baseline and follow-up images reviewed by both raters, there was agreement on the presence or absence of additional hemorrhages in 13 of 15 cases (87%, kappa = 0.73). Also, whereas most of the studies were read with knowledge of the sequence in which they performed, we had three pairs of MRIs (Cases 1, 15, and 19) read without knowledge of which study represented baseline or follow-up. In each of these cases, the rater identified additional hemorrhages exclusively on the follow-up study. Appearance of new hemorrhages was related to the number of hemorrhages at baseline. Additional hemorrhages appeared in 8 of 17 (47%) patients with probable CAA but only in 1 of 7 (14%) with a solitary hemorrhage at baseline (p < 0.01 for comparison of number of new hemorrhages). Even within the probable CAA group, a greater number of hemorrhages at baseline predicted more new hemorrhages at follow-up (p < 0.001). Postmortem examination in one patient (Case 24) 2 years after follow-up MRI demonstrated severe CAA. Two large chronic lobar hemorrhages and abundant smaller areas of hemosiderin deposition were evident, ranging in size from punctate deposits adjacent to amyloid-laden vessels to millimeter-sized areas of hemosiderin and tissue loss, all restricted to lobar brain regions. The cohort for this study included both patients with a clinical diagnosis of probable CAA and those with a solitary hemorrhage only in whom the etiology of hemorrhage is considered less certain. It is noteworthy that those with probable CAA tended to develop more hemorrhages at follow-up than those with solitary hemorrhages, suggesting that they indeed represent a subgroup at higher risk of recurrence. Similarly, more new lesions developed in patients with probable CAA with higher numbers of hemorrhages at baseline. These observations support the ability of gradient-echo MRI to help distinguish CAA from other causes of lobar hemorrhage and to identify cases of CAA with more aggressive vasculopathy. Several limitations of our pilot data must be considered. The cohort for this study, although chosen prospectively, was relatively small and not necessarily representative of all lobar hemorrhage patients. Our estimate for the incidence of new hemorrhages thus clearly requires confirmation in larger patient cohorts. In addition, the technical aspects of distinguishing small hemorrhages on gradient-echo MRI from other hypointense lesions can be difficult. A recent study, for example, found only moderate agreement among three experienced raters.5 Although agreement on individual lesions could not be assessed in our study (and there were several clear instances of substantial disagreement on total counts, e.g., Case 22), we found interrater agreement generally to be high for both the total number of hemorrhages on the scans and the presence or absence of additional hemorrhages at follow-up. Another concern regarding the validity of MRI measurement is the possibility that some lesions are present but not detected at baseline (e.g., situated between MRI slices), only to be misidentified at follow-up as “new.” If hemorrhages were easily missed, however, a comparable number might be expected to disappear on the follow-up study. This generally was not the case, even when the rater was blinded to the sequence of the studies, suggesting that new lesions detected at follow-up indeed represented new hemorrhagic events. The effect of small hemorrhages on neurologic function is variable. They have been noted in association with particular clinical syndromes such as transient neurologic symptoms or rapidly progressive dementia.8 In most patients, however, they are clinically silent. Only limited conclusions can be drawn in this regard from the current study, which by design focused on patients with few neurologic events during follow-up. Nonetheless, several of our patients were able to tolerate an abundance of old and emergent hemorrhages without evident clinical deterioration. The approach described here provides a noninvasive means for marking one aspect of CAA progression. Serial gradient-echo MRIs might thus serve as a basis for future pilot studies of potential risk factors (e.g., apolipoprotein E genotype7) or protective treatments for this currently untreatable disorder. Supported by grants from the National Institute of Health (AG00725), American Heart Association, and Edward Mallinckrodt, Jr. Foundation. The authors thank Drs. David A. Schoenfeld and Yu Chiao Chang of the MGH General Clinical Research Center and Clinical Research Program for assistance with statistical analysis, and Drs. Jean-Paul G. Vonsattel and Diane Karluk of the C.S. Kubik Laboratory for Neuropathology for review of pathologic materials. Vinters HV. Cerebral amyloid angiopathy: a critical review. Stroke 1987;18:311–324. Bornebroek M, Van Buchem MA, Haan J, et al. Hereditary cerebral hemorrhage with amyloidosis-Dutch type: better correlation of cognitive deterioration with advancing age than with number of focal lesions or white matter hyperintensities. Alzheimer Dis Assoc Disord 1996;10:224–231. Greenberg SM, Finklestein SP, Schaefer PW. Petechial hemorrhages accompanying lobar hemorrhages: detection by gradient-echo MRI. Neurology 1996;46:1751–1754. Offenbacher H, Fazekas F, Schmidt R, Koch M, Fazekas G, Kapeller P. MR of cerebral abnormalities concomitant with primary intracerebral hematomas. Am J Neuroradiol 1996;17:573–578. Roob G, Schmidt R, Kapeller P, Lechner A, Hartung H-P, Fazekas F. MRI evidence of past cerebral microbleeds in a healthy elderly population. Neurology 1999;52:991–994. Roob G, Fazekas F, Kleinert R, et al. Histopathologic findings associated with MRI detectable old microbleeds accompanying intracerebral hemorrhage. Neurology 1997;48:A203. Abstract. Greenberg SM, Briggs ME, Hyman BT, et al. Apolipoprotein E ε4 is associated with the presence and earlier onset of hemorrhage in cerebral amyloid angiopathy. Stroke 1996;27:1333–1337. Greenberg SM, Vonsattel JP, Stakes JW, Gruber M, Finklestein SP. 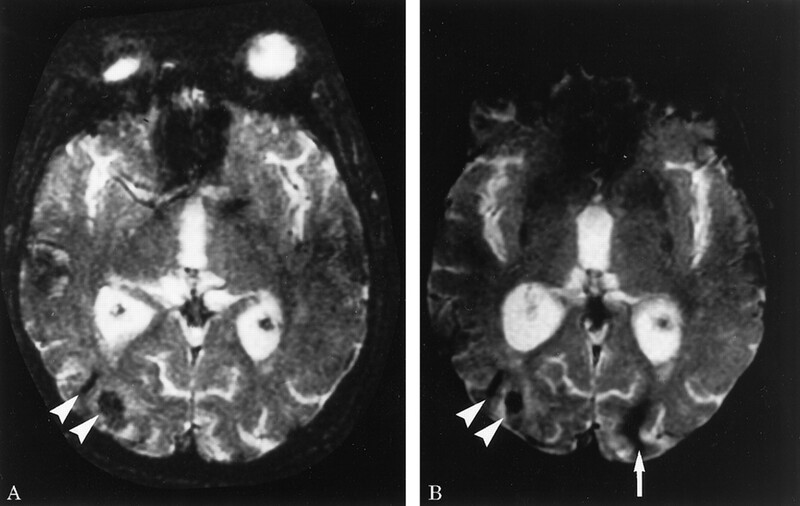 The clinical spectrum of cerebral amyloid angiopathy: presentations without lobar hemorrhage. Neurology 1993;43:2073–2079. Passero S, Burgalassi L, D’Andrea P, Battistini N. Recurrence of bleeding in patients with primary intracerebral hemorrhage. Stroke 1995;26:1189–1192. O’Donnell HC, Rosand J, Chiu RI, Furie KL, Ikeda D, Greenberg SM. Apolipoprotein E genotype predicts hemorrhage recurrence in cerebral amyloid angiopathy. Stroke 1999;30:255. Abstract.